Learn how to create fun 3 Dimensional objects using paper maché, mixed media, and found objects. In this class we will explore form, structure, techniques and applications relevant to sculpture. 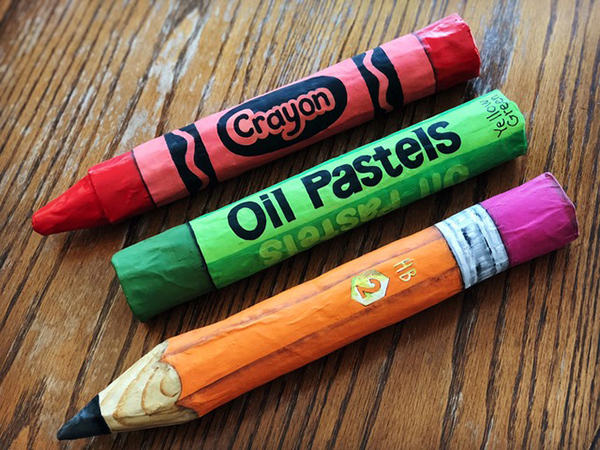 From giant 3D pencils using found objects and paint, to giant paint tubes using paper maché and mixed media, this class is sure to be exciting! Sculptures will be put on display for a short time following completion of class and then returned to students. Dates: Wednesdays 3/13, 3/20; 4/3, 4/10, 4/24. Makeup 5/1 or Thursdays 3/14, 3/21; 4/4, 4/11, 4/25. Makeup 5/2.